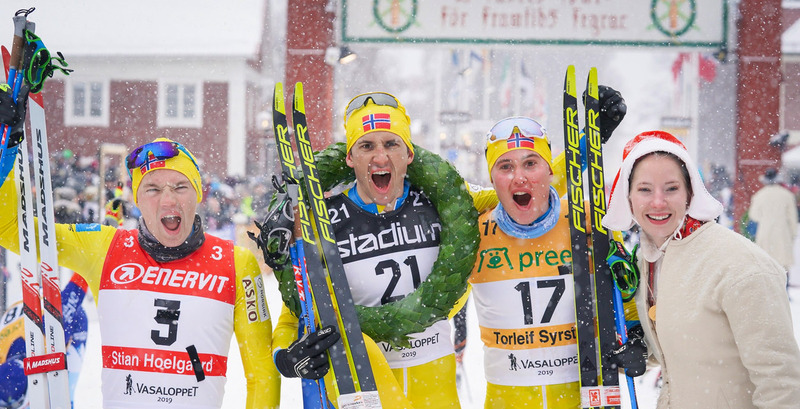 Team Koteng had a glorious day in Vasaloppet as the team’s pro skiers managed to lock all podium places. Tore Bjørseth Berdal broke away five kilometers before the finish and won the race while Britta Johansson Norgren, Lager 157 Ski Team, left her opponents behind early to win the women’s race. The 95th edition of Vasaloppet, the largest ski race in the world, took place in extremely challenging conditions as it kept snowing throughout the race and some gusty winds made the 90 km journey even harder. In the men’s race, there were no decisive breakaways or key action until the final five kilometers. Berdal took advantage of an opportunity given to him by his teammates and broke away from the huge lead group. He was able to maintain the gap and finished the race as the winner. He was followed by his teammates Stian Hoelgaard and Torleif Syrstad. Last year’s winner Andreas Nygaard, Team Ragde Eiendom, was fourth. In the women’s race, Johansson Norgren found a suitable male group to follow, which gave her an edge over her rivals Lina Korsgren, Team Ramudden, and Katerina Smutná, ED System Bauer Team. She was able to stay with the group and keep up her steady pace. She finished the best part of four minutes ahead of Korsgren, who beat Smutná in a sprint finish. Olof Jonsson, Team Ramudden, won the first sprint in Mångsbodarna while Stanislav Rezac, Slavia Pojistovna Team, was the fastest at the second one in Evertsberg. Johansson Norgren won both women’s sprints. There were no climb competition points on offer in the race. Johansson Norgren and Nygaard lead the Hertz champion competition while Anton Karlsson, Lager 157 Ski Team, is the number one skier in the sprint competition. Johansson Norgren wears two other bibs, sprint and climb, in addition to the champion category. Morten Eide Pedersen, Team BN Bank, holds the first position in the men’s climb competition. Syrstad took the lead in the men’s youth category while Sofie Elebro, Team Ragde Eiendom, is the leading lady in the same competition. Lager 157 Ski Team is now facing a tight fight against Team Ragde Eiendom and Team Koteng in the pro team category. Today’s winners are also the leaders of the Visma Nordic Trophy, a mini-tour within Visma Ski Classics, that runs until Yllas-Levi at the end of the season. The next event in Visma Ski Classics is Engadin Skimarathon, the first skating race in the tour’s history, on Sunday March 10. Visma Ski Classics press release.